Logan Lucky Trailer May Reveal The Wild Ride This Summer Needs - Are You Screening? As a curious summer approaches, filled with superheroes and tentpoles that seem unable to deliver at the box office, the Logan Lucky trailer makes for a welcome retreat into comedic insanity. The Steven Soderbergh film seemingly stars everyone and revolves around a heist that is undertaken by the unlikeliest of criminals. Jimmy and Clyde Logan (Channing Tatum and Adam Driver) are after robbing the take from stock car race and you aren’t going to easily run across two more bumbling potential thieves. Enlisting the aid of Joe Bang (Daniel Craig), who they apparently break out of prison, the duo set their scheme in motion, but it never quite seems that even they are all that interested in the effort. Something of an anti-Ocean’s 11 meets the Coen brothers, the film looks to explore a dark, dry comedic take on the screwball, which just furthers Soderbergh’s effort at Isaac Asimov-ing his way through genres. 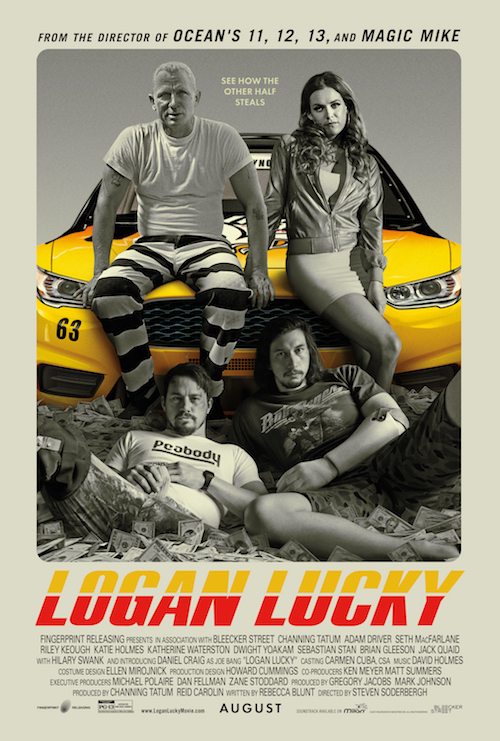 Logan Lucky also stars Seth MacFarlane, Riley Keough, Katie Holmes, Katherine Waterson, Dwight Yoakam, Sebastian Stan, Brian Gleeson, Jack Quaid, and Hilary Swank. It would be interesting to get a solid idea of the supporting roles and how much time those characters get on screen, especially when it comes to people like Seth MacFarlane and Katie Holmes. Still, if comedy is your genre, this is your summer treat. Take a look above and hit the comments and forum to let us know what you think of this one.